The official weigh-ins for “UFC 147: Silva vs. Franklin II” take place today inside Mineirinho Arena in Belo Horizonte, Minas Gerais, Brazil. Stream Friday’s weight contest live right here on 5thRound.com starting at 3PM ET/12PM PT. 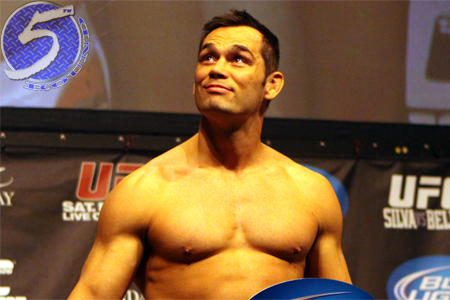 Former middleweight champion Rich Franklin (Pictured) will enter hostile territory to meet Wanderlei Silva in the show’s featured attraction. The mixed martial arts icons will battle in a 190-pound catchweight contest. Tomorrow’s pay-per-view broadcast begins live in North America at 10PM ET/7PM PT.